Today Stacey has a tutorial for us on how to take one of my favorite basics, the Tee x 3 and kick it up a notch. 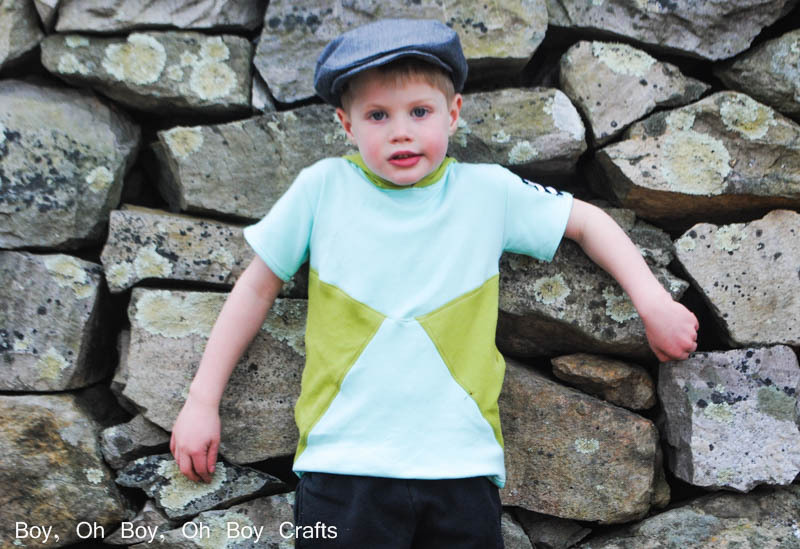 Hi, Stacey of Boy, Oh Boy, Oh Boy Crafts here today with a tutorial for creating an inverted triangle t-shirt with your hooded Tee X 3 pattern. This pattern has so many options, it’s quickly become one of my favorites. 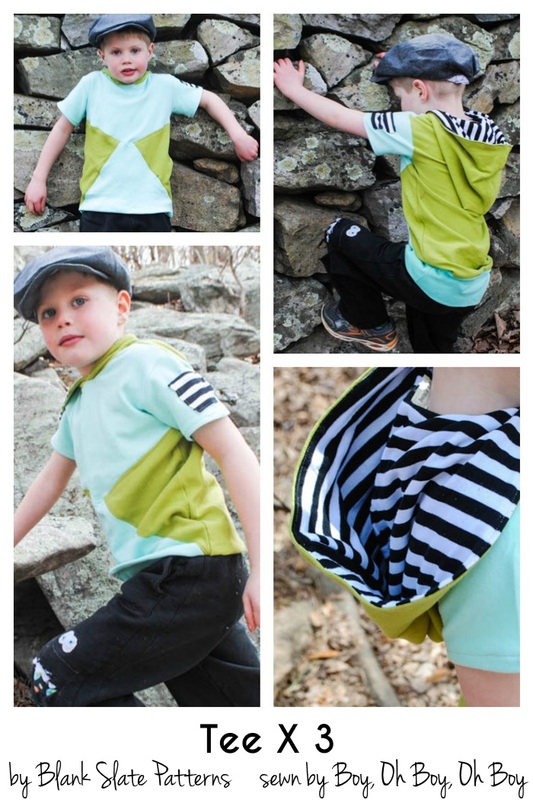 You can see two of my faux layered tee version here or the short sleeve hooded option here. 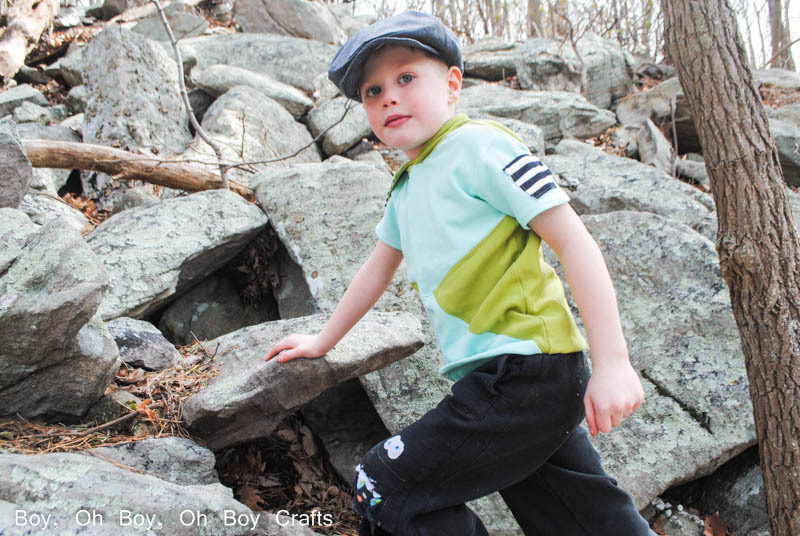 By making a few simple pattern cuts to the front bodice and added seam allowances, you’ve got a way to bring added interest by playing around with color blocking and pattern mixing. 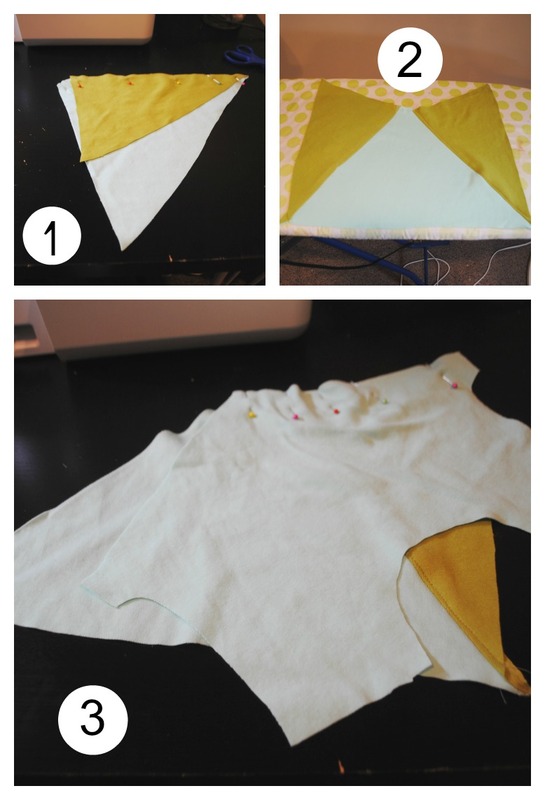 Here’s how to create and sew the pattern pieces for the inverted triangle t-shirt. 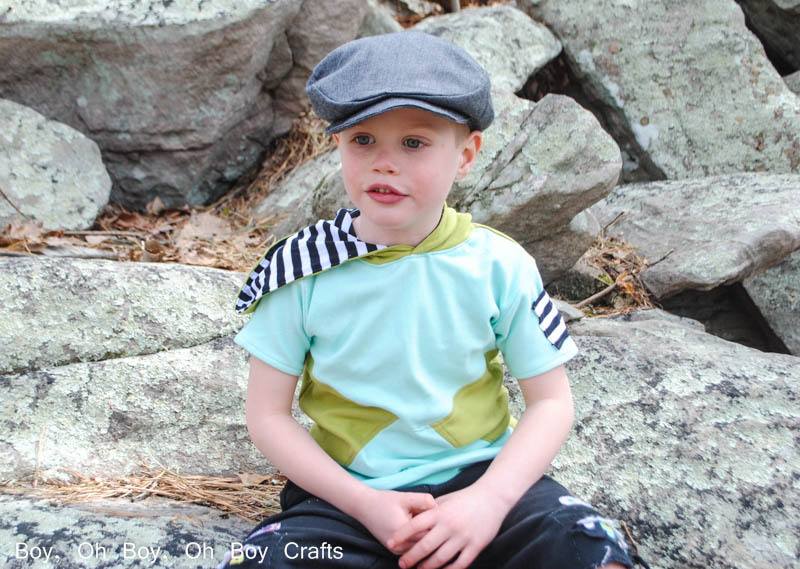 Start by creating your “color blocking” lines on the original pattern piece. Fold the bodice piece in half and draw a line at the half way mark. Now draw a diagonal line from the left side of this line to the bottom of the arm scythe and another from the same point on the left to the bottom right hand corner. 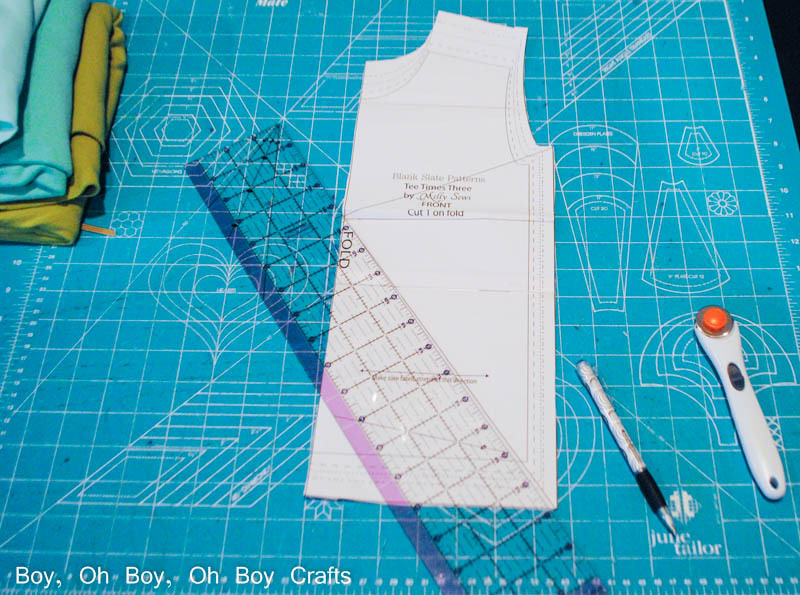 Cut on the two diagonal lines (creating 3 pattern pieces), trace each piece onto craft or pattern making paper and add a 1/2 inch seam allowance to the bottom of the top piece and the long diagonal side of the bottom left triangle. You’ll need to cut 1 top piece on the fold, the bottom middle piece on the fold, and 2 mirror images of the third piece. 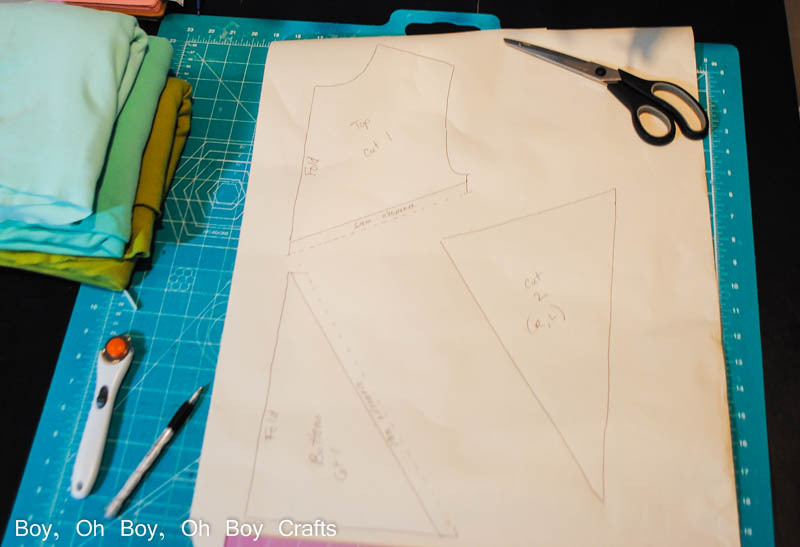 To sew the bodice pieces, start by pinning and sewing one small triangle piece to the larger middle piece, using a 1/2 inch seam allowance. Press seam allowance to the side and top stitch. Repeat with the other side. Then pin, right sides together, the bottom edge of the bodice top, matching the center top, with the center of the color blocked portion. Sew with a 1/2 inch seam allowance (if needed, cut a notch in the seam allowance where the two points meet), press, and top stitch. Once the front bodice is complete, you can now carry on with the original pattern instructions for whichever pattern options you’ve chosen. 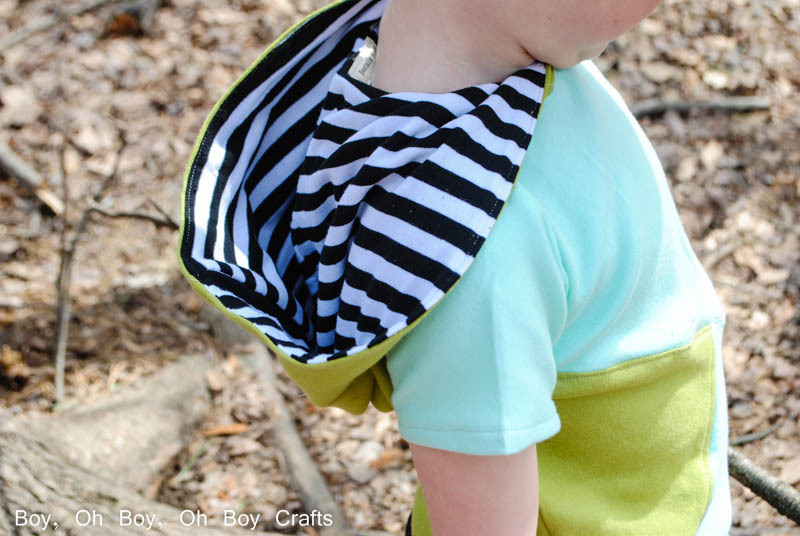 You can play with color and patterns by choosing to match the sleeves to the top triangle or hood. I went with a contrast pattern inside the hood to really give this inverted triangle a modern edge and added a ribbed band to the hem for longevity since this guy tends to grow straight up. I also added a tiny coin pocket for keeping the little (non-living) treasures he finds along the way. 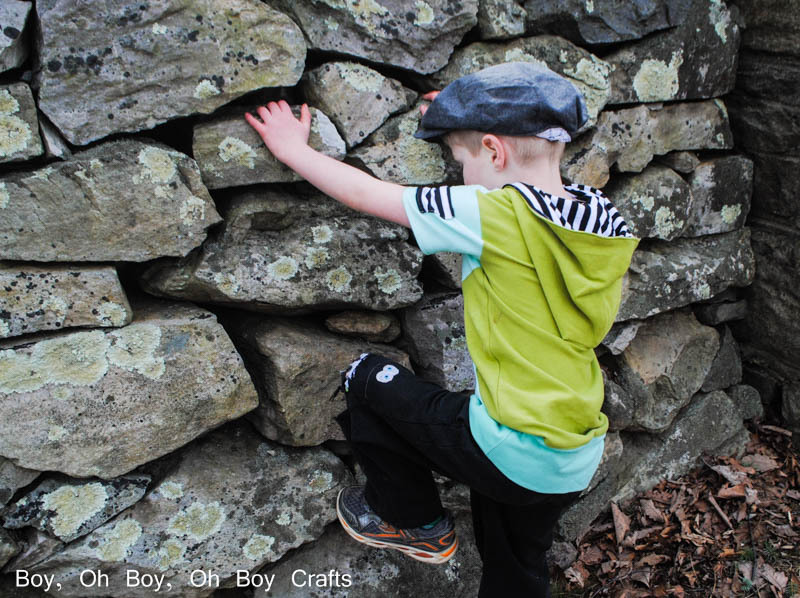 These mint and lime green organic knits from Organic Cotton Plus were just perfect for this project and I can tell already, after its multiple washings, that I don’t have to worry about it shrinking. Which means he’s free to wear his new favorite shirt whenever he wants (aka; whenever mommy gets around to washing it-AGAIN).